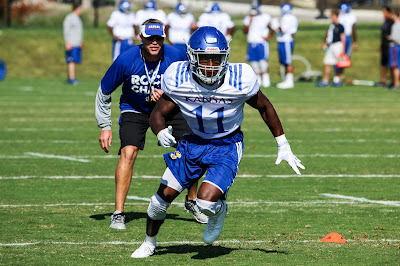 This is from 2017 fall camp, but would you know if it wasn't? Is it good when a player gets kicked off your college football team before fall practice starts? Is it good when another gets kicked off the team before the first game? I think we already know the answers to these questions. The college football team in question is the Kansas Jayhawks, and the players involved are, uh, two guys I’ve never heard of, and I apologize to their friends and families for that, but it is true. Even if one of those guys was the second-leading receiver on the team last year, and that is also true. This tells you the state of KU football before the opening game of the season. I must tell you at this point that I am a KU alum. Since you have gotten to this point I am going to assume that you are as well, because why on earth would you also be interested in a football team that is this bad? (It is also quite possible that we know each other, so in that case, hi Ann and Charlie!) The only reason to follow KU football at all is you are an alum, a student journalist for the university, or are being paid to do so. Since you’ve gotten this far- and it doesn't matter which of the three ways you qualify- we shall continue. The head coach, David Beaty, currently has three wins as Jayhawks head coach. Not three wins last season. Three wins total. For comparison’s sake, Alabama usually has three wins after the first three games of the season. Since Kansas won the Insight Bowl on December 31st, 2008, they have- and I wish I was kidding here- they have 19 total wins, 5 conference wins, and are on their fifth head coach. In their eight most recent seasons, they have as many conference wins as head coaches. Attendance, you might expect, was not noticeably different that Saturday when the Hawks got hammered by Texas, 23-0. Charlie Weis was fired the next day. Clint Bowen was named interim head coach, and David Beaty was hired after that season. So yes, Charlie Weis telling people that they could be doing a lot worse than voluntarily watching KU football was rock bottom. 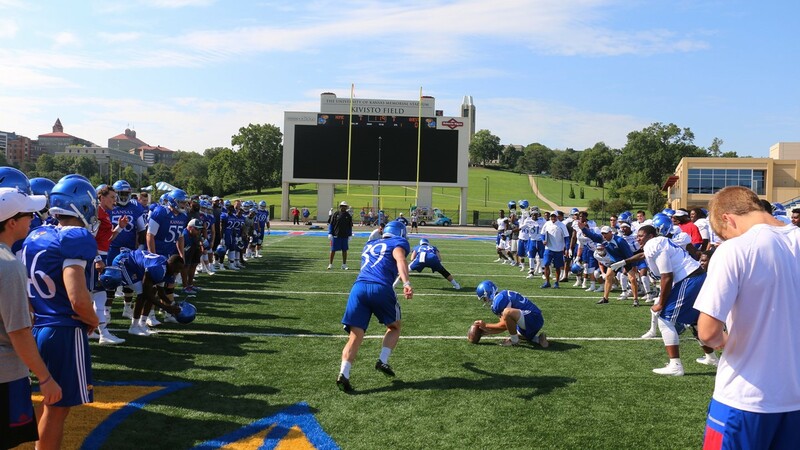 Recently, it has seemed that KU football is so bad they couldn’t even get an opponent for week one. This year they do play week one, and will host FCS Southeast Missouri State. Yes, they should beat SEMO. But will that really tell us anything, aside from that they shouldn’t be relegated to SEMO’s conference? No. No it won’t. It would be nice if KU won easily, and it would be nice to break a few long scores as opposed to grinding it out. Because if you need 15-play, 10-minute drives to score against SEMO, you are going to go backwards against Oklahoma. Since it’s the 10-year anniversary of the 2007 Orange Bowl champion team, Mark Mangino will be back in the house, as will cornerback Aquib Talib. I know that Beaty and assistant head coach Clint Bowen both coached under Mangino, and both credit him as a fine human…. But he didn’t exactly leave KU on the best of terms. Would you invite back a head coach who was found guilty of academic fraud and got the program put on probation, even if he was really, really successful? To put it another way: Larry Brown didn’t come back for 25 years.